Julia Louis-Dreyfus scores some new co-stars in her latest for Old Navy, and the ensemble suits her well. 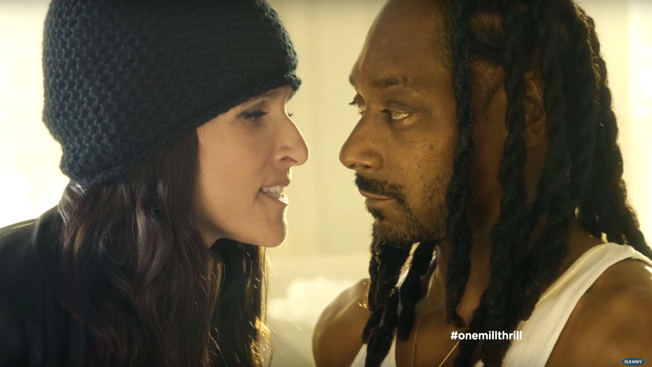 The Veep and Seinfeld actress ties up rapper and marijuana poster boy Snoop Dogg in an attempt to strip him of a million dollars in this heist-themed ad for Old Navy's Black Friday sweepstakes, which promises the same sum for its prize. Her getaway driver? Comedian Kumail Nanjiani, whose credits include Silicon Valley. The centerpiece ad, a 2:20 film, is given the cringe-inducing (if accurate) title "Snoopin' Around." But the spot is plenty entertaining, with enough absurd dialogue to keep it moving at the right clip. Nanjiani steals the show with winning ineptitude, including a nod to Dogg's best-known work, the 1994 hit "Gin and Juice." Louis-Dreyfus is hard-pressed to improve on her last performance for the clothing retailer, where she played an overbearing mother for back-to-school season. But she doesn't slack off here, displaying an incompetence that makes it unclear whether she's trying to intimidate or seduce Snoop, culminating in a mostly-ridiculous—yet perfect—insult: Calling him "Daddy Long Legs." The approach expands on the brand's recent drive to emphasize female comedians, which include Amy Poehler. Wayne McClammy, adept with both celebrity stars and humor, directs to good effect. A :30 cut aired Sunday on TV, but it's not as strong as the full version, partly because it doesn't have Snoop's takeaway from the experience: That he needs to get off Instagram, stat (which is sound advice for anyone). The outtakes below also fall short of the ad itself, a rare deviation from the norm. Snoop Dogg will also be doing radio spots for the brand (a smart choice, given his distinctive voice).